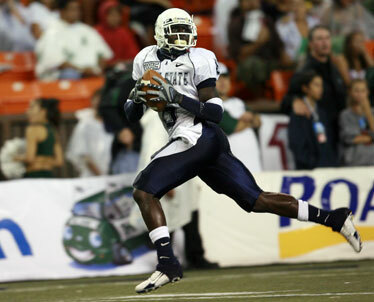 Kevin Robinson scored twice for Utah State -- once on a 100-yard kickoff return and once on a 77-yard reception. Talented, dangerous and fast are three effective ways to describe Utah State's Kevin Robinson. The senior receiver and kick returner showed all three and more in last night's 52-37 loss to Hawaii at Aloha Stadium. Robinson's 100-yard kickoff return for a touchdown gave the Aggies a 10-7 lead with 6:48 left in the first quarter. It was the first of three Utah State leads in the first half of what turned out to be a semi-blowout. "Kevin Robinson is obviously one of the best all-purpose guys I've ever been around," said Aggies coach Brent Guy, whose team has now lost 12 straight games, including six defeats with no wins this year. "He has good hands and good speed in the open field. He's the type of guy that makes other players around him better." Robinson struck with his big-play ability again in the third quarter, hauling in a deep pass from Leon Jackson III and finishing off a 77-yard touchdown play by changing direction twice to keep the Warriors' defenders guessing. He shook off an ankle-tackle attempt by Hawaii safety Jake Patek just before diving into the corner of the end zone. "On the kickoff return, the coaches did a great job with the scheming," Robinson said. "On the first (return of the night), I went the wrong way and the coaches talked to me about that. We had all the right matchups that we wanted. The coaches said that (if things go as planned) then all I'd have to do is beat their safety or their kicker. I took that as a challenge. "On the touchdown pass, it was a designed play, an out and up. Their cornerbacks were jumping the house pretty hard. After the catch, I was just running to try and get there." The 6-foot, 199-pound senior has done all of this razzle-dazzle stuff before. Five times previously in his four-year career, Robinson scored return touchdowns -- three on punts and two on kickoffs. Last night's return was a career long. Earlier this year, Robinson went over the 2,000-yard career receiving mark. "We told the coaches that we should be throwing the ball more," Robinson said. "Let's throw the ball and let's go deep, we told them. They believed in us and let us do it. "We knew they (the Warriors) were going to score a lot. Our motto was that we gotta score a lot, too. We reached our goal of scoring 30 points, but we didn't hold them." Jackson had glowing words for his go-to receiver. "He's extraordinary," Jackson said. "We've been together since we were freshmen. We feed off each other, and he's always going out there giving 100 percent and I know if I throw it up, he's going to go up and get it. As a quarterback, you've gotta love that. He's one of my best friends and a dang good player." As the clock wound down, Robinson gave his gloves to a young Warriors fan in the seats at about midfield. It was a nice gesture, and a good way to cap his high-flying Hawaii performance.